"Our nation has lost its greatest son. Our people have lost a father." Whoever wrote South African president Jacob Zuma's speech on the passing of the man who broke apartheid had a long time to choose his words, and proved up to the task. 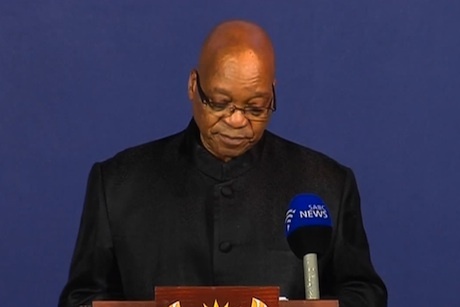 The BBC interrupted its programming last night to bring viewers the statement from Zuma, which is reproduced below together with video footage. Our beloved Nelson Rolihlahla Mandela, the founding president of our democratic nation, has departed. His humility, his compassion and his humanity earned him their love. Our thoughts and prayers are with the Mandela family. To them we owe a debt of gratitude. Our thoughts are with his wife Mrs Graca Machel, his former wife Ms Winnie Madikizela-Mandela, with his children, his grandchildren, his great grandchildren and the entire family. We will always love you Madiba.